When I first moved to the St Louis metro area over 20 years ago, a friend introduced me to Andria's restaurant in O'Fallon, IL. They lived up to their reputation then and now by preparing one of the best steaks in the area. Their signature steaks are basted in their own sauce, and I have to tell you that the sauce is well worth adding to your backyard endeavors. I really enjoy using this sauce as a marinade for steaks, but it goes equally well on chicken breasts and pork chops. It's unique flavor adds a bit of salt & garlic goodness to the meat whether you "brush it on" as they apparently do in the restaurant or choose to marinade as I do. I recently grilled two whole beef tenderloins for a Christmas gathering. I marinated each of them for 4 hrs in a zip lock bag full of Andria's sauce. When I placed them on the grill, I used the leftover marinade as a basting sauce throughout the cook. I received rave reviews from the diners at our party. I've never met anyone who didn't enjoy steaks prepared in this manner. If you're in the St. Louis area, the local grocery stores carry the product. If not, it's available online here . I've had family in town for a long weekend and we've had a world class weekend running the cookers. Today, I decided it'd be steak & potatoes in recognition of my father-in-law's birthday. Last week I took a run at trimming a beef tenderloin and slicing it into steaks. This week I elected to roast the tenderloin whole. Wow! This thing rocked. I cooked it till it was ~155 degrees in the thickest part. This allowed me to cut steaks of different levels of doneness to allow for personal preferences. Here's a shot the whole tenderloin cut in half before I carved it. I know, seems like a oxymoron to me too. By my definition (and I think that of many others), BBQ is indirect cooking at low temps. Grilling, on the other hand, is cooking directly over a hot fire. So imagine my surprise when my brother began to describe his method for grilling burgers, chicken breasts, etc. 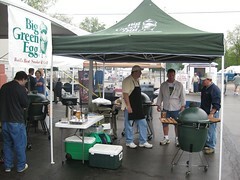 with an indirect setup on his Big Green Egg. Apparently, he leaves the platesetter in place, brings the temp up to 350 degrees or more, and cooks indirect. Now I suppose you could argue that this is like cooking in an oven, but it's a method that I need to investigate. Anyone else ever do any "indirect grilling"? Leave a comment an let me know. You want my advice, or not? I'm often asked for a recommendation on a backyard cooker. Many times, I've recommended a Big Green Egg to folks who've subsequently bought one and seem to be fairly happy with their decision. However, at least twice over the past year I've been asked for my opinion by folks who ulitimately didn't care for my advice. You see, I don't have a standard answer to the question "What cooker should I buy?". I typically answer that question with a question of my own like, "What sort of things do you like to cook? ", or "Do you think you'd enjoy the process of creating slow cooked BBQ?". Based on how folks answer those questions and how they respond to a quick lesson on the difference between "BBQ" & "Grilling", I've recommended a variety of different cookers. Sometimes when folks are used to lighting the gas grill and immediately throwing the meat on, it's hard for them to imagine the planning and time required to turn out great BBQ. To those folks, I recommend that they buy a gas grill and keep grilling. But they don't always appreciate or like that advice. Sometimes they want me to convince them that they will enjoy the process and that the commitment is worth it. Frankly, I can't convince anyone to enjoy the process of cooking good BBQ. If you are unsure about committing to tending a live fire or committing to the time then by all means cook the way you're used to cooking. There's nothing wrong with cooking on a gas grill. Heck, the stores are full of them so somebody must be buying them. If you’re a regular visitor, you know that I’ve been cooking on the Big Green Egg for a couple of years and recently acquired a Bubba Keg to add to my arsenal. While both follow the tradition of the Kamado style cooker, they employ slightly different construction materials and techniques. In my first head-to-head throwdown, I was surprised when the Bubba Keg came out on top. In that test, I smoked a load of pork steaks on each cooker and submitted the results to family & friends for their choice of the best. Big Green Egg - Ribs OnI took advantage of the great weather over the weekend to conduct Round 2 of my throwdown between the Bubba Keg & the Big Green Egg. In this head-to-head competition, I bought a package of baby-back ribs from Sam’s Club, prepared them identically, and put half on the Bubba Keg & half on the Big Green Egg. I started the fires at the same time (actually one right after the other since I was working alone), using the same fuel & indirect setup in both cookers. I typically do ribs in a modified 3-2-1 method. However I decided that to keep things as consistent as possible and eliminate as many variables as I could, I’d go low & slow for ~5 hrs and evaluate the results. Here’s how things turned out. Fire Control – As I’ve said before, I find it much easier to control temp on the Big Green Egg. This cook was no different, but I do find that I’m getting better with the Bubba Keg. The thing I took notice of on this cook was the elapsed time to “ready to cook”. In order to keep the Bubba Keg fire under control, I really have to take my time in bringing the fire up the target temp. However, I can rush the Big Green Egg right up to temp and be ready to cook very quickly. Advantage here remains with the Big Green Egg. Cooking Environment – I commented during the last throwdown that the cooking environment seemed to much more moist with the Bubba Keg. Again, I was impressed by how much so during this cook. As stated earlier, I did not employ the 3-2-1 method. However, the ribs from the Bubba Keg were falling apart as though I had foiled them. The ribs off of the Big Green Egg were a little firmer and more like competition ribs that have a little tug but pull clean from the bone. This one’s too close to call as it really is a matter of preference as to how you prefer your ribs. Taste Test – I was really surprised in this category. My family & the friends who helped in the blind judging are used to eating ribs from the Big Green Egg prepared with the 3-2-1 method. So I really expected the preference to be for the ribs from the Bubba Keg, since the expectation has become that the ribs fall off the bone. 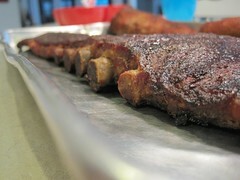 However, 6 out of 8 testers actually chose the ribs from the Big Green Egg. Advantage, Big Green Egg. Round 2 of the head-to-head throwdown goes to the Big Green Egg. So I’ve spent two glorious afternoons cooking on a couple of pits that produce some awesome BBQ. I’ve tried to quantify the differences and find an advantage to one or the other, and I think I’ve done so. However the margin of victory in each head-to-head competition is so slight that it’s really difficult to call a winner and in some cases it’s a matter of personal preference. If you’re cooking on either the Bubba Keg or the Big Green Egg, you have chosen a cooker capable of grilling, baking or producing great BBQ. If you're considering either of these cookers, you're making a great choice.